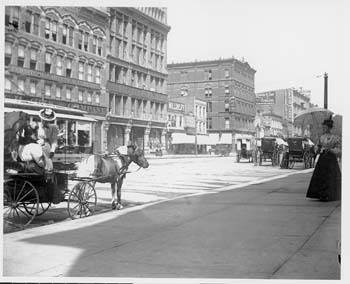 Woodward Avenue circa 1880.In the foreground, a pony pulls a carriage carrying women shoppers. A few decades hence, the scene would change irrevocably, with motorcars replacing the beasts. 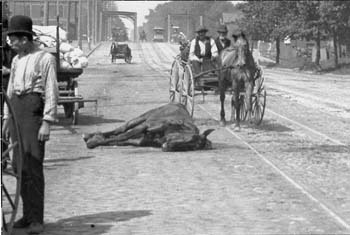 A horse lies dead on Fort Street, about 1885. Horses often dropped dead from exhaustion or were shot on the spot if they had broken a leg. When was the last time you saw a dead horse on a Detroit street? For that matter, when was the last time you saw a live horse on a Detroit street? The occasional mounted policeman or princess-fantasy wedding carriage can still be spotted on Woodward. But everyday scenes of Ol’ Dobbin clopping purposefully through city neighborhoods or, more poignantly, lying in a heap at the curb, done in by a broken leg or an overworked heart, belong to an equine era long past. It was a swift, if disorderly, transition from horse-drawn to horse-gone, a revolution that some stubbornly resisted. John C. Lodge, whose career in Detroit government spanned several decades, thought motorcars a nuisance and refused to learn how to drive one of the newfangled machines, a rejection that didn’t prevent authorities from later naming a freeway after him. The February 1900 issue of The Horseshoers’ Journal, a locally published trade journal, predicted that horseless carriages would “to some extent become a fad to be put aside when the novelty of the thing has worn off,” at which point “the dear old horse will be called to again assume and retain his old accustomed place.” Such hubris was understandable. At the time, there were only about 8,000 motorcars in the entire country, compared with an estimated 17 million horses. Ransom Olds had just opened the world’s first auto-manufacturing plant on Jefferson, near the Belle Isle Bridge, but the initial vehicles were pricey, hand-assembled models that kept them well out of the reach of most folks. The nascent auto industry was not even listed in the 1900 U.S. Census, and a 1904 brochure put out by the Detroit Convention Bureau failed to make a single mention of the motorcar. As companies named Olds, Cadillac, Ford, and Packard fought to gain a foothold in the early 1900s, urban life continued to revolve around the horse. Not many Detroiters actually owned one — caring for the creatures was expensive, time-consuming, and messy — but signs of their presence were everywhere. Many residences had horse blocks and hitching posts at curbside and carriage houses in back. Hundreds of stables, blacksmith shops, harness makers, and veterinarians catered to the horse trade. Horse racing was one of the area’s first and most popular spectator sports, with several tracks in and around Detroit. A great deal of romance surrounded the horse. Four-term mayor Hazen S. Pingree joined pharmacist James Vernor (of ginger-ale fame) and lumberman Russell Alger, both former cavalrymen, in extolling the virtues of their loyal four-legged servants. Another leading citizen, Thomas W. Palmer, singlehandedly funded the Michigan Society for the Prevention of Cruelty to Animals for more than 30 years. 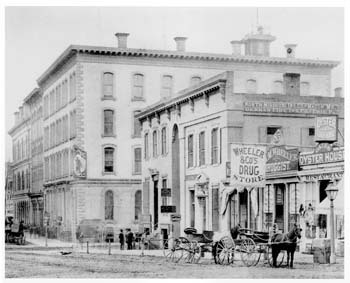 An 1875 photograph of Griswold, before the encroachment of cars. By 1920, a dramatic shift had occurred. There were thousands of horses on Detroit’s streets at the turn of the 20th century, and their relationship with humans was far from perfect. A spooked horse might collide with a trolley car, trample pedestrians, or crash through a store window, but even the best-behaved steed was a public health hazard. Horses deposited several thousand pounds of manure and a measureless quantity of urine onto the streets each day, a nuisance only partially alleviated by the small army of “white wings” using brooms, shovels, and wheeled barrels to clean up the fetid, fly-blown, disease-breeding waste. A dead horse lying in the street or an alley was a common sight. Hopelessly worn-out or injured horses were summarily dispatched with a bullet to the head from a policeman or a humane-society agent. A Detroiter remarked on one he found rotting in the gutter on Woodward at High (now Vernor) in 1905: “Its carcass was left so long on the spot where it fell, that the residents began to believe it would eventually become a monument to its owner.” Horse cadavers typically were fed to swine, sold to a tannery, or carted off to a landfill. “Detroit as an auto center is endeavoring to give the horse a rest,” animal-rights activist Jefferson Butler said hopefully in 1911, by which time local automakers were annually producing hundreds of thousands of cars and trucks. Most day-to-day cruelty continued to pass unpunished. New York actress Clara Pare admitted during a visit to Detroit to being “stirred up over the condition of helpless, dumb creatures” unable to protect themselves from thirst, starvation, overloading, and regular whippings from ignorant and unfeeling drivers. “I never saw a city which offers as great a field to the humane worker,” she said. The department had employed thousands of horses since 1865, some serving 10 or more years before being sold to farmers, but by 1908 there was no longer putting off the future. 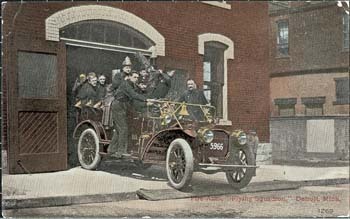 That year, the department unveiled its “Flying Squadron,” a roomy Packard filled with fire extinguishers, axes, and a dozen firemen. It was “the fastest piece of human machinery in Detroit,” an observer marveled, a “throbbing, clanging devil wagon” that hit speeds exceeding 40 mph while responding to alarms. In a few more years, the entire department would be motorized. The man most responsible for putting the world on wheels, Henry Ford, had disliked horses since one had dragged him around his farm as a 9-year-old. He exacted revenge with the introduction of his Model T in 1908. Ford’s “mechanical cockroach” proved to be the low-cost, utilitarian motorcar ordinary people had been waiting for. 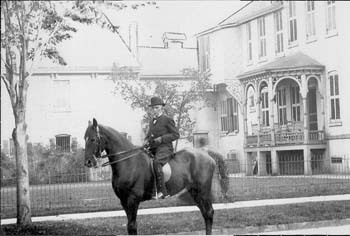 Detroit businessman George Bissell astride a horse. In 1902, he became the city’s first auto-related fatality. Horses once clopped around downtown’s Cadillac Square, but by the time this postcard was mailed in 1917, cars crammed the area. Leaving more expensive vehicles to the “sports” was not a strategy unique to the hundreds of carmakers in business then. The Sears-Roebuck Co., for example, offered a Sears Motor Car in its 1910 catalog for $395. Ford’s genius was in passing on to the consumer the savings he realized through improved mass-production techniques. Contrary to legend, Ford didn’t invent the assembly line. Rather, he perfected it — first at the Highland Park plant, then at the massive Rouge complex in Dearborn. Before then, cars had been built on sawhorses by craftsmen. The breaking down of assembly into simple repetitive tasks not only created jobs for hundreds of thousands of unskilled workers, it brought the price of a new car into everyone’s reach. As the time required to build a Model T chassis continued to drop, from nearly 13 hours to just 93 minutes, so did the price, from $850 in 1908 to $290 in 1924. By World War I, half of all cars in use were Model T’s. Before Ford quit building them in 1927, more than 15 million “flivvers” had rolled onto America’s primitive, rutted roads. One of the seminal events in Detroit’s history was Ford’s introduction of the $5 day on Jan. 5, 1914. At the time, typical industry wages were 30 cents an hour. Ford’s announcement in a single stroke more than doubled the prevailing minimum wage for autoworkers. The news stunned the business world and made Detroit a mecca for unskilled laborers from overseas and around the country. Ten thousand applicants mobbed the employment office at the Highland Park plant the day after the announcement. Ford also replaced the two 9-hour shifts with three 8-hour shifts, meaning the assembly line never stopped. A standard joke was that the beds of many local boarding houses never had a chance to cool off, as one shift left for work just as another came to sleep. At its peak, the Highland Park plant employed 70,000 workers, a figure equal to Detroit’s entire population less than a half-century earlier. This was an exciting time to be here, where a giant sign atop the Detroit Opera House proudly directed people to “Watch The Fords Go By.” Citizens also watched life as they once knew it fly past, as the automobile ushered in social upheaval on an unprecedented scale. Such fashionable residential districts as Woodward and Cass avenues seemed to change overnight. Gas stations and dealerships sprang up while stately homes were sold and subdivided into boardinghouses. 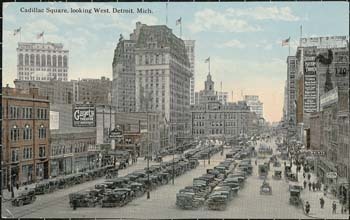 Between 1900 and 1930, Detroit’s population increased six-fold, to 1.6 million, making it the nation’s fourth-largest city. The once-somnolent communities of Hamtramck and Highland Park were transformed into factory boomtowns. Throughout the core city and its outskirts, century-old shade trees were toppled, meadows were developed, and dirt streets were widened and paved over, all in a desperate attempt to keep pace with the insatiable demand for factories, housing, roadways, and parking space. 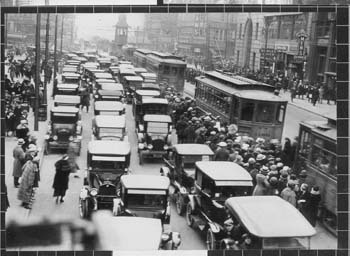 Introducing motorcars into already crowded city streets led to a new term, “traffic jam.” It was coined in 1910, the same year Detroit saw its first motorized funeral and the police department debuted its own “Flying Squadron,” a souped-up Oldsmobile that sped to crime scenes with up to 15 officers clinging to its doors and running boards. To combat the rising number of accidents and deaths, new road regulations regularly appeared, but motorists were slow to adopt most of them and policemen initially were reluctant to enforce them. Chaos reigned. In 1917, the first “crow’s nest”-style signal tower appeared on Woodward, creating a highly visible (at least in daytime) symbol of authority with the power to singlehandedly regulate traffic flow. Within a few years, the signal towers were replaced by synchronized electrical systems, which proved to be far better traffic devices. In 1920, the modern four-way traffic signal using red, green, and amber lights was created by William L. Potts, an employee of the Detroit Police Department. It debuted at the intersection of Woodward and Fort. As the number of vehicles on the road continued to grow, smash-ups and fatalities grew exponentially. However, their numbers began to fall after the Detroit Automobile Club (today AAA Michigan) started installing more than 2,400 red-and-white stop signs at hazardous intersections in 1923. 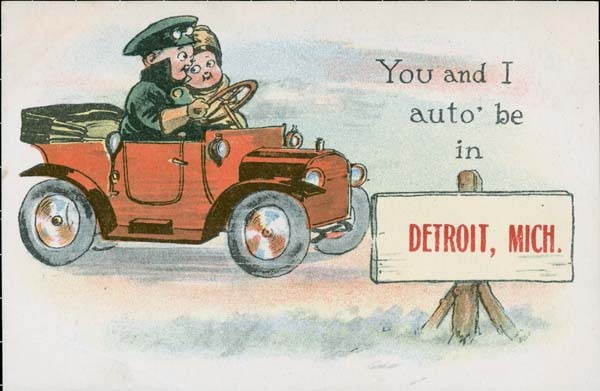 A cute postcard from 1910 touts the romance of the automobile. Fuel was another problem. Early motorists depended on the direct delivery of gasoline from tank cars or sidled up to pumps installed inside barns and blacksmith shops. In 1910, the Central Oil Co. built Detroit’s first drive-in gas station with an island at the northeast corner of Fort and First. Soon, gas stations were a ubiquitous part of the landscape. Throughout, horses and motorcars had an uneasy co-existence. There were frequent collisions, with the horse often getting the worst of the encounter. Oil and grease made asphalt streets slippery, resulting in more than one horse breaking a leg and being put down on the spot. Between 1900 and 1920, the number of automobiles on American roads increased a thousand-fold, from a mere 8,000 to more than 8 million. There still were two horses for every motorcar in 1920, but by the end of the decade that ratio was reversed. In Detroit, the industrial “city of tomorrow,” the changeover was even more pronounced, though horse-drawn peddlers, milk wagons, and junkmen wouldn’t completely vanish from its streets and alleys for many more years. By the 1960s, the handful of holdouts were curiosities from a past that, because of the rapidity of change, seemed much more distant than it really was. When trying to fix a date when the Motor City symbolically completed the conversion from horse power to horsepower, April 10, 1922, serves as well as any. At 1 o’clock on that Monday afternoon, downtown traffic was stopped for several minutes as two horse-drawn fire rigs pulled out of their station house and ceremoniously answered a last alarm on Woodward. Whistles shrieked, bells clanged, a band played, and citizens let out a collective hurrah. Afterward, the last of the fire department’s faithful horses, including a 14-year veteran named Ol’ Ned, were retired to Belle Isle. The Rev. Joseph Dutton, a Methodist minister from Birmingham, happened to witness the spectacle as he sat inside a halted streetcar. The lines of a tribute “began to sing themselves through my mind,” he explained to the Free Press, which published the resulting poem. Bak is a Dearborn-based freelancer and frequent contributor. 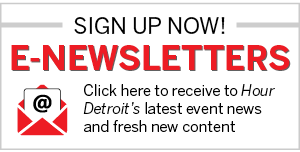 Email: editorial@hourdetroit.com.